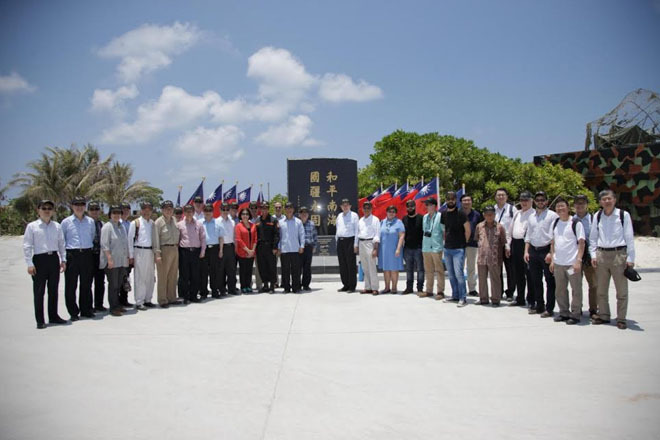 A group of experts on international law and political science from Taiwan and abroad toured Taiping Island in the ROC’s Nansha (Spratly) Islands April 15 to gain a better understanding of conditions there. The visit, at the invitation of the ROC government, came a day after the scholars had taken part in the International Conference on South China Sea Disputes and International Law at Soochow University in Taipei, where they were addressed by President Ma Ying-jeou and held wide-ranging discussions on related issues, including the arbitration by the Philippines against mainland China, and mechanisms for the peaceful resolution of disputes in the region. Foreign academics joining the island tour came from Austria, Greece, Indonesia, the Netherlands, United Kingdom, and United States. The South China Sea has in recent years been subject to a series of sovereignty disputes impacting ROC sovereignty and legal rights over islands and their surrounding waters. In January 2013, the Philippines initiated arbitration against mainland China concerning the South China Sea in accordance with Annex VII of the UN Convention on the Law of the Sea. During the second hearing from November 24 to 30, 2015, the Philippines distorted the facts and misinterpreted the law to argue that Taiping Island is a rock and not an island, and that it therefore should not have any maritime entitlements beyond 12 nautical miles. As an award is expected in this arbitration later this year, the Soochow University conference and trip to Taiping proved very timely. On the island, the scholars surveyed the wells, natural vegetation, farm, Guanyin Temple, historical sites, solar power system, lighthouse, wharf, and communications equipment, as well as the Nansha Hospital. Dr. Tang Shi-yeoung, research fellow at Academia Sinica’s Research Center for Humanities and Social Sciences, introduced the group to the cultural and historical features of Taiping Island, including the Guanyin Temple, built in 1959 to meet the spiritual needs of personnel stationed on Taiping Island. Following the inspection visit to Taiping Island by this group of international scholars, the ROC government once again reiterates that Taiping Island is the largest naturally formed island in the Nansha Islands, can sustain human habitation and economic life of its own, and meets the criteria of an island as defined in Article 121 of UNCLOS.